January | 2013 | Beer Apprentice - Craft Beer News, Reviews, Interviews and Info. Hello again everyone. Thanks for checking back in on another craft beer review. For today’s tasting I’m going to be trying the Jester King Le Petit Prince produced by the Jester King Craft Brewery located in Austin, Texas. So far, I’ve been really impressed with the other Jester King brews I’ve tried, therefore I see no reason to believe that this one will not be solid and satisfying. From the website, jesterkingbrewery.com, I discovered this pleasant little description of the Le Petit Prince. A clear and simple expression of the delicate interplay between noble hops and farmhouse yeast. Throughout Northern Europe, light-bodied, well-hopped, low alcohol table beers were often the beverage of choice with all meals at times and in places where the water wasn’t always safe to drink. This beer came in a 25.4 oz. bottle with an rather low 2.9% ABV. It poured a semi-hazy, golden color with a nice white head. It was sized fairly well and it had a somewhat soapy and fizzy texture. The retention time was ok and the lacing looked pretty good I thought. Not bad on the appearance. The nose brought forth some lemon citrus, a bit of yeast and a decent waft of clean white bread. It was slightly floral too. Hints of grassy hops and wheaty grain accompanied a very light funkiness and peppery spice. The taste was very, very, very light. I guess that was to be expected considering. It was lemony, grainy and grassy. Maybe a touch of straw as well. That was about it. I didn’t detect any funkiness or spiciness in the flavor. I was just a tad surprised by that especially since the nose was fairly complex and lively. Oh well. The mouthfeel was thin bodied. Smooth, crisp, refreshing and thirst quenching. I found it to be quite watery also. The carbonation was of medium strength and not a terrible amount of flavor was left behind on the palate after the swallow. Overall, I found this beer to be acceptable and agreeable, yet not quite as powerful as some of the other low ABV brews I’ve tried in the past. It’s definitely not a beer that’s going to overwhelm you with flavor, but that’s not a common factor with a “table” beer like this anyway. That’s not saying that it’s devoid of character. It has enough to keep one interested, however I do believe that it is meant to be drunk without much fanfare. It would be perfect with a meal during those hot and humid days of Summer for sure. It could have been because I tried it during the middle of December or something, but I was just hoping for a little more from this beer. Maybe I’ll try it again in a few more months and have a different take. 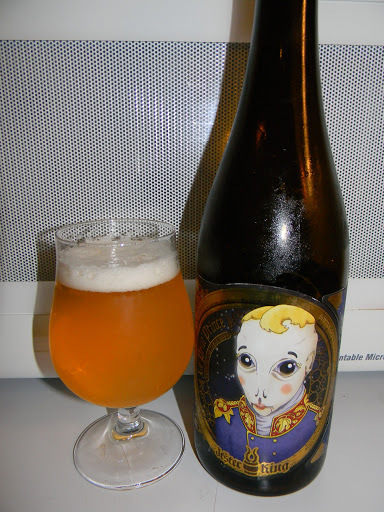 So, with that being said, give the Jester King Le Petit Prince a try if you have yet to do so and tell me what you think about it in the comments. Hi guys. For today’s craft beer review I’m going to be sampling the Saison Cazeau produced by the Brasserie De Cazeau located in Templeuve, Belgium. I can’t say that I know much about this brewery or this beer, so let’s just go ahead and check out the website, www.brasseriedecazeau.be, and see what kind of information they provide. 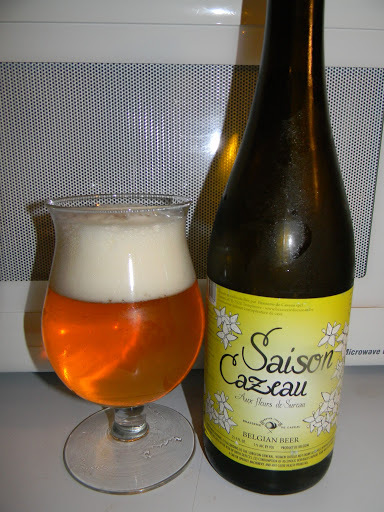 Saison Cazeau is a light white beer, refermented in the bottle, with 5% alcohol content. As well as the Pilsen malt and two hops which give it a really nice bitter flavour, Saison is laced with elderflowers (Sambucus Nigra L.) which make it really refreshing. The elderflower only blooms for three weeks between mid-May and mid-June, which means that production of our Saison is very time-limited. Ok. That sounds nice enough. Let’s give it a try. This brew came in a 25.4 oz. bottle with an ABV of 5.0%. It poured a very clear, golden to yellow color. A bright white, well sized head was formed from a medium aggressive pour. It was soapy, fizzy and semi-rocky. The retention time was suitable and lacing was patchy and somewhat clingy. It looked pretty nice standing in the tulip I thought. The nose was clean and fresh. Springtime grass, freshly baled straw and floral notes popped at first. Those characteristics were followed by a light, lemony citrus and semi-sweet Pilsner”esque” malts. Some breadiness and a very slight peppery spice finished it off. Overall, a nicely balanced and pleasant bouquet. The taste was also very clean and fresh and nearly identical to the fragrance. Grassy hops intermingled with bready malts and subdued lemon citrus savors. The meager peppery spice gave a slight bite at the back end while the modest sweetness helped provide a nice “push/pull” profile that added some complexity. The mouthfeel was medium to medium/thin bodied. Very crisp, smooth, refreshing and thirst quenching. The carbonation was quite lively, however that didn’t hinder the flavor from sticking around on the palate for a few minutes after each swallow. I thought this beer was solid for sure. Very much like a more complex Pilsner than a Saison in my opinion though. Not saying that’s a bad thing or anything. The drinkability was outstanding and I do believe that it would be a spectacular beer to have during the warmer months. Particularly after mowing the lawn or doing some yard work. I’d have no trouble drinking it again I’ll tell ya that and I’d recommend that you give it a shot if it’s available in your area. Have you guys ever tried the Saison Cazeau? What did you think? Was it worth your time and effort? Feel free to leave a comment if you’d like. I’d love to hear from you. Thanks for reading everyone. I greatly appreciate all the support. Hello again everyone. For today’s craft beer review I’m going to be trying the Haand Bryggeriet Røyk Uten Ild (Smoke Without Fire) produced by the Haand Bryggeriet Brewery located in Drammen, Norway. The label stated that this was batch #426, which had 2160 total bottles. Let’s get to the website, haandbryggeriet.net, and see what it has to say about this brew. Røyk Uten Ild (smoke without fire) is our smoky beer, here we have tried to make a beer as smoky as we can using our smoked malt from Weiermann. We have made a fairly dark and flavourful beer. Apart from the special malt the rest of the malt bill (86%) is smoked malt. You could also say that this is a smoked wheat beer, because we have used our wheat beer yeast here. The beer is not scary but actually very nice even for those that aren’t smoke beer fanatics….try it and you will see. That sounds very intriguing. Let’s get it in a glass and see how it is, shall we? The beer had an 8.0% ABV and it came in a 16.9 oz. bottle. It poured a deep brown color with shimmers of ruby showing through when held toward a light source. The crown was light tan, relatively smooth and creamy. It was sized well, the retention time was ok and the lacing looked alright too. Not bad to begin with I must say. The aroma released a nice and sturdy waft of smoke. Hints of bacon grease and smoked ham along with some toasted breads, worn leather and charred wood. I didn’t really find any of the wheat characteristics that the description spoke of, but that was fine by me because this beer smelled very good nonetheless. It seemed a little one dimensional, however when sampling a smoked beer I don’t want complex… I want smoke. The taste was more of the same. Savors of smokey bacon and pork fat. A taste or two of burnt toast and wood as well as a very light relish of alcohol. I will say that I did kind of pick up on some yeast as the beer warmed a bit. It may have just been my mind playing tricks on me though since I was searching for it. Again, a very nice and enjoyable flavor. The mouthfeel was medium to full bodied. Dry, chewy and smooth. The carbonation was of medium strength with a light feeling of warmth. An excellent shot of flavor was left behind on the palate after each sip too. Overall, I found this to be a great smoked beer. In my opinion, one of the better smoked beers on the market. I really, really like this style of brew, although my intake is usually limited to just one bottle. I tend to get a bit overwhelmed if I have more than that. 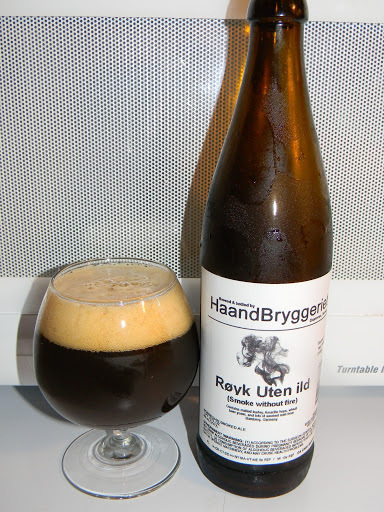 With that being said, I definitely think the Haand Bryggeriet Røyk Uten Ild (Smoke Without Fire) is worth a try and it would totally hit the spot on a cool Winter’s night. Like I mentioned before, this smoked beer is a bit one dimensional, but that shouldn’t deter you from giving it a go if you happen to see a bottle at your bottle shop. Be sure to leave a comment and tell me all about your experience if you have tried this beer. I love to hear a second take.